Just a 45 minute drive west from Orlando, the Space Coast offers a very different type of getaway. Nature plus space-age attractions: that's the message for this stretch of Florida that includes Cocoa Beach, Cocoa, Cape Canaveral, and other communities.When I visited with two teens, we expected to visit the Kennedy Space Center and learn about space launches, and we also expected miles of beaches.What we didn't expect was a nature boat tour where we glided past mangroves and spotted the "footprint" of a manatee. In fact, the entire 700,000 acre Kennedy Space Center is in the midst of the Merritt Island National Wildlife Refuge. Allow a full day to visit: the 2-1/2 hour bus Tour of Restricted Areas --that takes you past giant launch pads and the "spacecrawler" -- is just the start.You'll also want time for the exhibits, I-Max and film experiences, and simulator training rides found at the Visitor Complex, at the Apollo/Saturn V Center and Astronaut Hall of Fame. 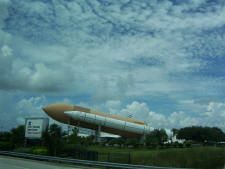 Read more about visiting the Kennedy Space Center Visitor Complex. A quintessential Florida experience, airboat rides transport visitors into quiet wetlands-- with a lot of noise. Put on your ear-muffs, 'cause the decibals are high on an airboat ride. The propeller is at the rear, not in the water, meaning the boats can skim very shallow depths. We saw a few 'gators, but were equally intrigued by cows grazing in water that was shoulder-high. Our tour started from a funky restaurant called funky restaurant called The Lone Cabbage, and afterward we returned to it, to eat the Lone Cabbage's deep-fried 'gator, catfish, and mozzarella sticks. Yet the name "Lone Cabbage" remained a mystery. A comfortable way to see the Space Coast's estuaries is by a guided boat tour. Island Boat Lines offers eco-tours with several departure points. Nature-lovers can also enjoy Sea Turtle Sightings. More than 6,000 loggerheads turtles, green seas and leatherbacks lay eggs in the sand on the Space Coast. From late May to early August, guided tours take small groups to the beach after sunset. From our open-air boat we saw anhingas and other birdlife, and the "footprints" (ripples at the water surface) of a couple of manatees. Town of Cocoa, Florida - Photo © Teresa Plowright. The Space Coast has some quaint town centers. Cocoa village -- not the same as Cocoa Beach -- is highly photogenic, with murals, brightly painted shops, street art, toy shop. One of Cocoa's murals - Photo © Teresa Plowright. Cocoa, Florida has a quaint main street with some historic buildings and inviting shops. Kids will enjoy the murals and fun touches such as statues lounging on benches. Cocoa Beach Pier: take a stroll on the pier, and watch the surfers; have a meal inside; then a double-scoop at Ricky's Ice Cream Parlor and Arcade. Seafood is especially good in this area, though meat is always on the menu too.